Alright, this post is going to be rather short. Reason? It’s late, I have a lot to do, and I shouldn’t be posting here in the first place… But I just wanted to throw out a link you may or may not have seen elsewhere. 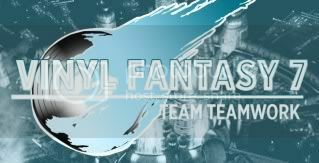 I’m not sure how many ever got around to hearing Team Teamwork’s album “The Ocarina of Rhyme,” but their new album “Vinyl Fantasy VII” follows in suit of the rap collaboration between multiple artists with music samples from the video game (Ocarina of Time and Final Fantasy VII, respectively). Both projects obviously have ups and downs, but I think Vinyl outshines Ocarina in terms of quality and music samples. Songs like Mako Reactor, Sailing from Junon (I’m pretty sure that song is called It’s hard to walk on two feet, but Junon is what the rap version says), Jenova, and Sephiroth’s Reunion sound like they are meant for rap. Some people may see it as a bastardization of the songs, but it’s really more or less a tribute to Uematsu by using his songs in a completely new light. It breathes new life into them and does something most people would never even imagine to do with them. If you like rap, I definitely suggest at least giving it a chance. When downloading it you choose how much you pay, and there’s no minimum. Want it for free? Go ahead and get it. But I’d say it’s worth some money; the production value is rather high. Are there any soundtracks you’d want to see remade in a new genre? List them in the comments section below. The link for those of you that want to grab this great collection of songs.